Based on the compact and power-efficient Bobcat core, the lower-end Fusion APU was initially aimed at netbooks. Obviously, when small size and power are the key, performance may be sacrificed. Full-size notebooks are to get another variant of the core — larger, more expensive and offering much better performance. Then a desktop APU should follow as well. However, Bobcat turned out to be faster that expected, outperforming Atom D525, the direct rival, in purely computational tasks. At that, as our today's review will tell, its graphics part is on a par with AMD's last-year desktop graphics solutions. Atom can only compete on these terms when coupled with an external GPU on the ION platform. So, if they make nettops based on ION, AMD E-350 should do at least as good. This is further confirmed by motherboard makers' support for the new platform. 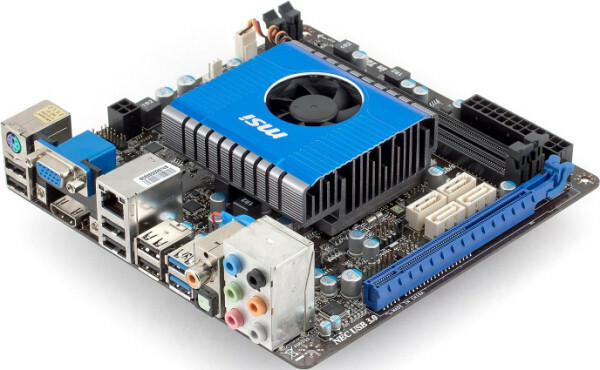 Today, we'll take a look at the MSI E350IA-E45 board made in the Mini-ITX form-factor, the most reasonable, given the purpose. Like any other Mini-ITX board, the layout of E350IA-E45 is dense enough, but it's single-sided, whereas many counterparts have elements on both sides of the PCB. 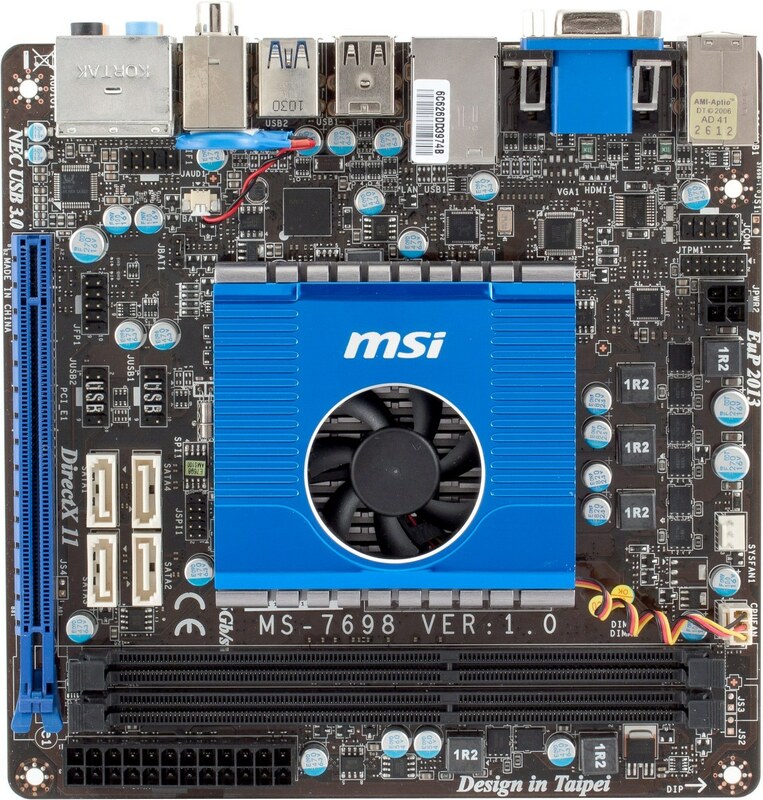 The only PCI Express x16 slot offers four PCIe 2.0 lanes. This should be enough for an external graphics card, given that no one would want to install a top-end solution into such a machine. The cooler does its job well, but the fan is rather noisy, like most of those 40-mm ones. Well, it would be logical to use the entire heatsink surface for a low-profile 60-mm fan or so. The engineers tried to make the board as compact as possible, and the highest part is the back panel. But that doesn't mean someone would want to put it next to an enclosure wall (or at least it would require providing an air gate right opposite the fan). Half a meter away from the motherboard — in an open enclosure — the noise is 35 dBA at the maximum fan speed. It only drops below 30 dBA at 50-75% of that speed. Perhaps, the BIOS hasn't been polished enough yet, but to make sure that fan slows down at least when the system is idle, you'll have to set the upper threshold of processor temperature (70°C). The heatsink stays cool under these conditions. Of all legacy interfaces, E350IA-E45 only has a COM port on a separate bracket. 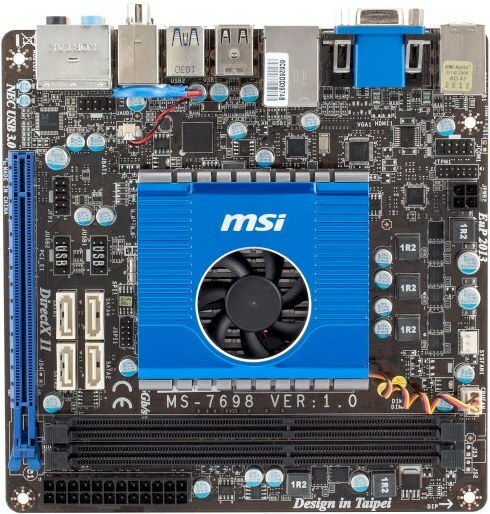 This is justified, because motherboards like this one are also used in kiosks and industrial automation where the serial interface is still very popular. 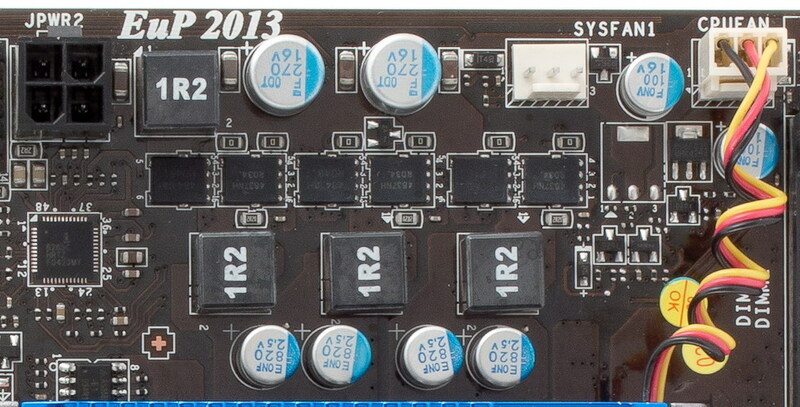 The back panel offers as many as eight USB ports, two of which are USB 3.0. All of those support the USB Safeguard technology that should protect from static electricity and plugging in defective devices. Audio interfaces include the standard six and optical and coaxial. Video interfaces include VGA and HDMI 1.3. Video can be output through both in the extended desktop mode. The CPU VRM has 3 phases and features Low RDS(on) MOSFETs. There are 4x820µF and 2x270µF solid capacitors. This is enough for processors with the TDP of 18W or less. The humble bundle includes a SATA cable, a back-panel faceplate, a user's manual and a quick start guide. 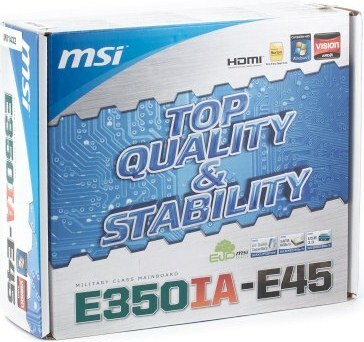 Like most MSI motherboards, E350IA-E45 supports Winki, a Linux distribution you can load instead of the primary OS to browse the Internet, read mail, send instant messages, or browse photos. It doesn't boot up much faster than Windows 7 does, mind you — in about 20-30 seconds.